Most of the text used on these pages comes from historic markers in front of the houses or from the Clifton Betterment Association's "The Historic Town of Clifton Walking Tour" pamphlet. The pamphlet is available at the Clifton General Store, Antiques of Clifton, and other local businesses for $1.00. Between 1991 and 2010 I lived in Clifton Virginia, a small town about 25 miles west of Washington D.C. One day in the summer of 1999, I was walking the streets of Clifton and the idea came to me of using the text on the signs in front of many of the historic houses as the source for a web page. After several months of coding and photographing, I came up with what you are now looking at. 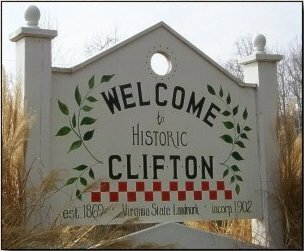 In 2010, we moved to the Denver, Colorado area and in March of 2011 I turned my original domain name of HistoricClifton.org over to the Clifton Betterment Association to be used in any way they desired. I am keeping a copy of the original site here for historical purposes. In 1863, during the Civil War, Herman Haupt, the superintendent of Union military railroads, commissioned John Devereux, the railroad superintendent in Alexandria, to build a siding here on the Orange & Alexandria Rail Road, the site became known as Devereux Station. When a passenger station was built in 1868, the name was changed to Clifton Station and in 1902 the town was incorporated as Clifton. The station spurred the development of clifton as a commercial and resort community, with its greatest growth occuring between 1890 and 1920. Although the station was removed in 1958, the town continued to thrive and remains noted for its late-19th-century architecture. Clifton was recognized as a state historic landmark and declared a National Historic District by the U.S. Department of Interior in 1985. Affectionately dubbed the "Brigadoon" of Virginia, the tiny Village of Clifton is elusive to most who travel through Fairfax County. A few have thought perhaps it was one of those mythical places that only appears on earth for a short time, every hundred years. One thing is certain, Clifton does exist and looks very much as it did 100 years ago. That is the way most townspeople, leading their customary lives, would like it to remain, a hidden treasure of a friendly town in Virginia, a place which everyone recognizes as "Small Town U.S.A." The cherishing of traditions and the will to preserve, enjoy and pass on what is so charming about the town of Clifton and it's way of life are characteristics of this miniature municipality. The ambience of the town is a testament to a time when people overlooked their personal interests and built neighborly homes that contributed to a sense of "place" in the emerging fabric of the town. The closeness of the buildings to the street suggests a slower-paced time when the social life centered on the street and the large front porches attended to it. Generations of community assent have built Clifton, and it is this spirit which has preserved it. Acacia Lodge No.16 A. F. & A. M.